Prairie School was a late 19th and early 20th century architectural style. It has its roots in the city of Chicago, Illinois. It was most common in the Midwestern United States, but its influence was felt around the world— especially in north-central Europe and Australia. 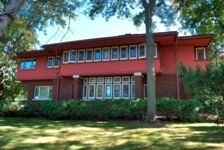 Prairie School style architecture is usually marked by its integration with the surrounding landscape, horizontal lines, flat or hipped roofs with broad eaves, windows assembled in horizontal bands, solid construction, craftsmanship, and restraint in the use of decoration. Horizontal lines were intended to unify the structure with the native prairie landscape of the Midwest. The emergence of the Prairie School style was nourished by a small group of dedicated individuals obsessed with the idea of creating a new American architecture. They wanted to develop an architecture style suitable to the American Midwest and independent of historical and revivalist influence. The movement attracted young designers, the best known among them being Louis H. Sullivan and Frank Lloyd Wright. The term "Prairie School" was not used by the architects to describe themselves, it was actually coined by one of the first historians to write comprehensively about these architects and their work, H. Allen Brooks. The Prairie School developed in tandem with the ideals and design philosophies of the Arts and Crafts Movement started in the late 19th century in England by John Ruskin, William Morris, and others. An alternative to the then-dominant Classical Revival influence, both architectural styles share a desire for simplicity and function. Like Arts and Crafts, the Prairie school embraced handcrafting and craftsman guilds as a response in opposition to the new assembly line, which they felt resulted in mediocre products and dehumanized workers. The Prairie School was an attempt at developing an authentic North American architectural style that did not share design elements with earlier European architecture. Many ambitious young architects had been attracted to redevelopment opportunities that arose from the Great Chicago Fire of 1871. The World's Columbian Exposition of 1893, otherwise known as the Chicago World's Fair, was supposed to herald Chicago's rise from the ashes. But the architects of what would become the Prairie School were disturbed by the Greek and Roman classicism of nearly every building constructed for the fair. Several of these young architects decided to create new projects throughout the Chicago area that would display a uniquely modern and authentically American style. They began sharing loft space in the newly built Steinway Hall in Chicago's Loop in 1896. The space was shared with Frank Lloyd Wright, Robert C. Spencer, Jr., Myron Hunt, Dwight H. Perkins, Walter Burley Griffin, and Marion Mahony Griffin, the first licensed female architect in the United States. The result was a vigorous intellectual, artistic exchange which would create the Prairie School style. The dominant horizontality of Prairie style construction echoes the wide, flat, tree-less expanses of the mid-Western United States. Frank Lloyd Wright, the most famous proponent of the style, promoted an idea of "organic architecture," the primary principle of which was that a structure should look as if it belongs on the site, as if it naturally grew there. Wright also considered the horizontal orientation of Prairie style to be a distinctly American design idea: The young United States had much more open, undeveloped land than in most ancient, urbanized European nations. The Prairie School was heavily influenced by the Transcendentalist philosophy of Ralph Waldo Emerson and the Idealistic Romantics, who believed that better homes would create better people. Subsequently, Prairie School architects influenced architectural styles that followed, particularly the Minimalist (less is more), Bauhaus (form follows function), De Stijl (grid-based design) and Constructivism (which emphasized the structure itself and the building materials). "The enthusiastic and able young men as proved in their later work were doubtless as influential in the office later as were these early ones but Wright's early concentration on publicity and his claims that everybody was his disciple had a deadening influence on the Chicago group and only after a quarter of a century do we find creative architecture conspicuously evident in the United States."